Since I've started work, I have come in to contact with alot of people my age, who no longer live at home with their parents. I feel like the little kid around them while they are talking about bills and getting their heating fixed and I'm not even making me bed in the morning. I am in no rush to move out although I am looking forward to being able to decorate a house how I want it to look. 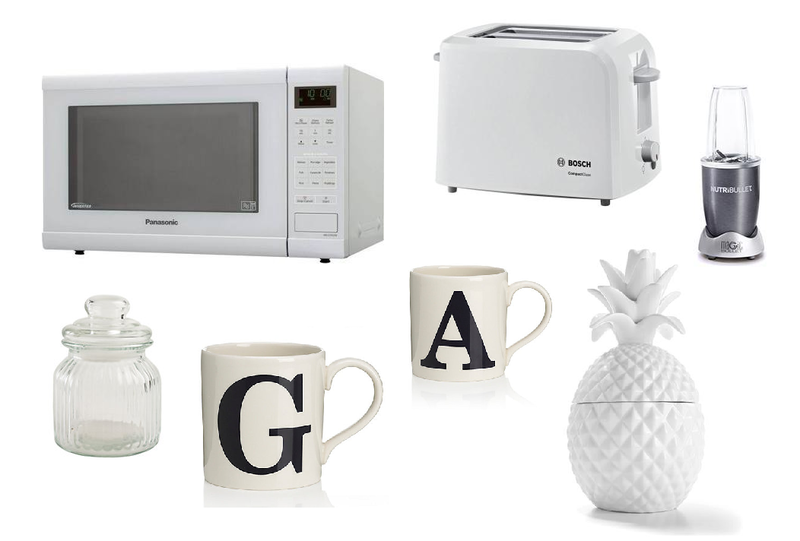 I always come across things in shops and think "I'd love something like that when I have my own house" so today is a bit of an imaginary homewear wishlist! It started out as a homeware wishlist but ended up being totally kitchen focused! When it comes to the house itself aka the walls, I want white everything. White walls are a must to keep everything feeling fresh, light and airy. I would love to get pretty white appliances for the kitchen too, you know, white toasters, white microwaves and a big white fruit bowl. And what am I going to do with all that fruit you ask? I would also have a nutribullet to make lots of yummy smoothies - duh. Pretty jars to keep whatever I fancy in them. Maybe colourful, individually wrapped sweets or nuts or something like that. I also love this pineapple shaped jar to put boring looking things like tea bags in. Taking of tea - I love this simple G mug and of course an A one for Andrew too! Whats On Your Kitchen Wishlist? I love the pineapple jar, it's adorable! I've been living on my own for 3/4 years now and my house still isn't exactly how I want it, boo! I've got a homeware wishlist as long as my arm haha! The initial mugs are a must too! Love posts like these! Especially love the pineapple jar. I've just bought a small pineapple candle which looks the same from h&m and I love it!